As most of my business contacts know I’m a long-term squash player. When I say long-term, I started playing when I was 17, so we’re not talking years, we’re talking decades! A number of decades. Anyway, at my current advanced number of years (for a squash player of course) I’ve recently come to realise that not only have I been making similar mistakes for most of these decades, but I’ve also recently started inventing a few new ones, something that I barely thought possible! But this of course is a sales blog not a squash blog, so what on earth have my inadequacies on the squash court got to do with sales? Well, I’m glad you asked! Time does pass very quickly and the business world of today is almost unrecognisable even from say 20 years ago. However, some things do remain constant. This applies to squash and it most deﬁnitely applies to sales. 1. Ditch the excuses. If you want to know why you’re performing, or not performing, take a look in the mirror. 3. Build your interpersonal ﬂexibility. Sales is all about building long-term relationships with the full range of different personalities. High performing salespeople adapt their approach depending upon the type of person they’re dealing with. 4. Be prepared to work hard. There is no substitute for hard work! Sales is about persistence & perseverance, not turning your computer off at 4.45pm so as you can leave at 5pm on the dot. 5. Learn from past successes as well as mistakes. Visualise your successes, remember what it looked and felt like when you were ‘winning’. This absolutely works in squash as it does in most sports as well as in business. Getting yourself in the right frame of mind to win will help you continue to win. 6. Maintain your hunger, desire and passion for sales. If you’ve lost it, or never had it, rediscover it quickly or go and do something else. 7. Focus on the needs of your prospect. 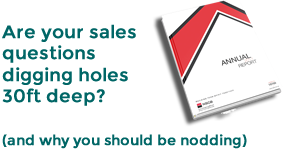 We bang on about this in these pages, but honestly there is nothing more important in your role as a salesperson. Ask intelligent, probing questions and actively listen to the answers. When your prospect is talking focus entirely on them. Sales is always all about them and never, ever about you. 8. Be curious. Curiosity increases the likelihood that you’ll uncover the needs of your customers. It also develops your ability to learn, listen actively & effectively, probe deeper and really get to the source of your customers’ issues. 9. Don’t be appalling! There are many salespeople out there who think they’re great salespeople but all they do is push product. 80% of salespeople don’t sell effectively, are you one of them? Seek feedback from customers and colleagues. Get your manager to shadow you on customer visits and have them coach you on your needs-based selling skills. 10. Follow up your prospects and be persistent. 90% of salespeople give up after 3 contacts, yet 80% of new business is written between 5 and 12 contacts. 11. Learn your products and services. Product knowledge is a sales skill, how can you hope to sell your products if you don’t have it? 12. Be open and honest at all times. That’s so important I’m going to say it again. Be open & honest at all times. The best way to be open & honest? Be open and honest! So, there you have it, my 12 enduring sales tips the ages. How do you score?